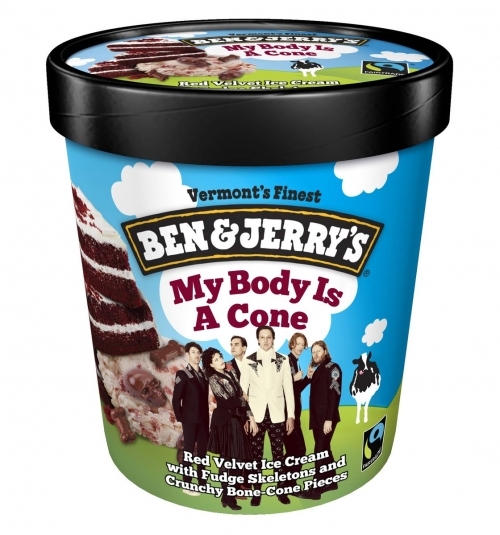 Arcade Fire's "My Body Is A Cone" Ice Cream? Updated 7/27/2017: Turns out, Arcade Fire are the kings of trolling. We reached out to Ben & Jerry's and they explained the following: "We're sorry but this is not a Ben & Jerry Flavor and we have no further information." Arcade Fire, the highly acclaimed indie rock band, are working with the ice cream giants, Ben & Jerry's. It's all listed below. To start though, we'll lead with a wonderfully whimsical clue: "My Body is a Cone." There is a lot going on, we'll also shed light on Arcade Fire's involvement in all things Brooklyn Vegan and Yondr. Combine Ben & Jerry's with Arcade Fire? It's a combo that not many could turn down, nor really understand for that matter. The band has recently announced that at the end of August, Arcade Fire ice cream from Ben & Jerry's will be available. Just imagine Ben & Jerry's sweetness sprinkled with Arcade Fire's signature wit. Arcade Fire ran a poll on Twitter to find a name for their Ben & Jerry's ice cream's flavor (all of this was in honor of National Ice Cream day...of course). "My Body is a Cone"
That's right, a big pun on their single "My Body is a Cage," which you can listen to below...and eat a themed ice cream to. Keep in mind, that these days everything is a meme and everyone is a troll, so it's highly unlikely we'll ever get to taste the flavor that involves 'fudge skeletons' and 'crunchy-bone pieces.' Then again, who knows, they did make cereal for "Creature Comforts," a track off their forthcoming album, Everything Now. Our dress code is HIP & TRENDY as if you are going to a concert or night out with friends! The event is standing-room-only so please plan accordingly. PLEASE DO NOT WEAR shorts, large logos, flip flops, tank tops, crop tops, baseball hats, solid white or red clothing. We reserve the right to deny entry to anyone dressed inappropriately. Yondr is a new development that allows show participants to keep possession of their phone, but removes their ability to use it. As people enter a venue utilizing Yondr, they place their phone in a bag which locks when entering certain zones.